BRAUNSTEIN, MAURICE "TITO": Of Pittsburgh, age 86, on Sunday, April 26, 2015; Beloved husband of Barbara Wolf Chotiner Braunstein. Loving father of Ronald (Carolyn) Braunstein of Burlington, VT, Richard (Ana) Braunstein of New York, NY and David (Elizabeth) Braunstein of Pittsburgh; Step-father of Richard (Karen) Chotiner of Houston, TX and Brad Chotiner of St. Louis, MO. Brother of Eugene Braunstein of California and the late Ronald Braunstein. Also survived by many nieces and nephews. Preceded in death by his former spouse, Geraldine Braunstein. An accomplished lawyer for five decades, Tito was also a profound lover of music and the arts. He was the Founder, Artistic Director and Producer of The Jewish Theater of Pittsburgh, and a leader in the community. He was also the choral director of the Beth Shalom Choir for four decades, and a recent member of Rodef Shalom. Tito was a strong, motivated, loving man who gave everything he had to all who knew him. He had a zest for life and all its nuances. His sense of values was beyond question and his sense of humor contagious. His sons Ronald, founder and music director of an orchestra and David, also a musician, followed in his footsteps, as did Richard, an attorney in New York. His wife Barbara brought him much happiness in the late years of his rich, full life. 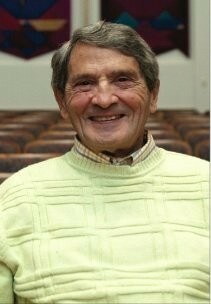 Services at Ralph Schugar Chapel, Inc., 5509 Centre Avenue, Shadyside on Tuesday at 2 PM. Visitation one hour prior to services (1 - 2 PM). Interment Beth Shalom Cemetery. In lieu of flowers, contributions in Tito's memory may be made to Me/2 Orchestra "Music for Mental Health", PO Box 4560, Burlington VT 05406. I grew up listening to Tito sing with Cantor Moshe Taube. Later, I was honored to count him as a member of our choir at Rodef Shalom Congregation. There is an empty chair and one fewer voice. I will miss him very much. My sincere condolences to you Barbara and the rest of the Braunstein family.